Muthambi v Jonas: Which model will public servants follow? In one corner: a former public servant best known for being good at his job but ousted from it after turning down a R600-million bribe from the Guptas. In the other corner: a current public servant who faces allegations of nepotism, financial mismanagement, having misled Parliament and having leaked confidential Cabinet information to the Guptas. 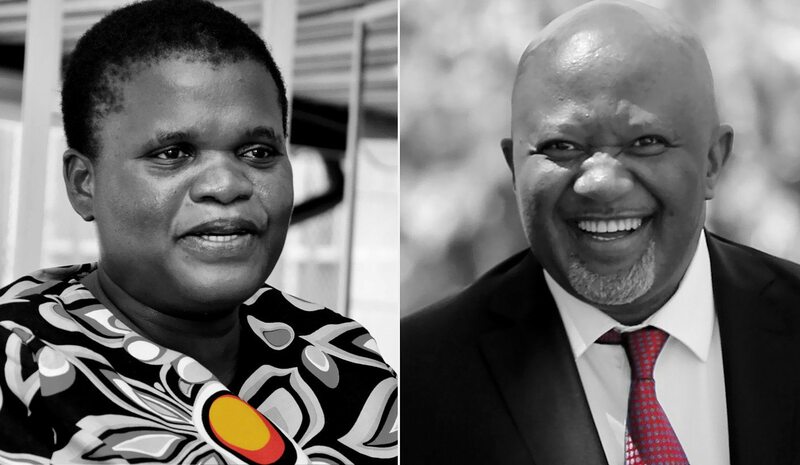 In some ways, the contrasting figures of Mcebisi Jonas and Faith Muthambi provide a metaphor for the battle for the soul of South Africa. On Monday, they shared a platform hosted by the union for government employees. By REBECCA DAVIS. Fredericks was unable to resist the lure of the pun when introducing Public Service and Administration Minister Faith Muthambi to the audience at the AGM of the Public Servants’ Association (PSA) on Monday. September is Public Service Month in South Africa, and the PSA’s AGM provided an opportunity to contemplate the varying models of public service available locally. A beaming Muthambi bounced on to the stage in a Pretoria conference venue, greeted by a resounding welcome. In her newish role at the helm of the Department of Public Service and Administration, Muthambi is both the literal and symbolic figurehead of the 250,000 state employees represented by the PSA. Perhaps Muthambi’s warm welcome at the AGM owes something to the fact that pay rises for government employees have just been confirmed, effective April 2018. “I think you need to buy me lunch, all of you, because you know the [Finance] Minister has approved your 5.5,” Muthambi chuckled, in reference to the 5,5% pay rise. Muthambi also promised the audience that senior managers in the public service who take unnecessary court action against employees will have to pay for that litigation from their own pockets. This may cause amusement from the Democratic Alliance: the party said in March that then-Communications Minister Muthambi should have to pay the legal costs of taking the SABC ad hoc committee’s report on judicial review from her own pocket. Muthambi appeared in breezy spirits on Monday, but this has been a torrid time for the minister, who is fighting fires on various fronts. Muthambi is accused of having flown 30 members of her family and friends to Cape Town for her May budget speech and having blown almost R3.2-million on imbizos during her first five months in office. Then there was the theatre of the absurd surrounding her alleged penchant for hiring family members. Muthambi first told Parliament last week that no fewer than nine of her family members had been employed to work in her office without their jobs being advertised. Her spokesperson then backpedalled, saying that Muthambi had said “none” of her family were employed rather than “nine”. These are only the latest scandals that Muthambi is facing, in a political career marked by perpetual controversy. When Muthambi left the podium, PSA manager Fredericks suggested jokingly that she should be referred to as “Faith double digit salary increase Muthambi” – another reference to the public service pay rise she has overseen. It was hard to imagine a more different follow-on speaker to Muthambi than the former deputy finance minister, Mcebisi Jonas. In what may have been an attempt to draw journalists from Jonas’s address, Muthambi proceeded to host a press conference in an adjoining room as Jonas began to speak. Muthambi, after all, is still at the heart of the Zuma loyalists; Jonas is persona non grata for his awkward whistle-blowing ways. What Jonas delivered, in stark contrast to Muthambi, was a thoughtful address considering the role of both unions and public servants in South African society. In an obvious reference to Cosatu, Jonas said: “The challenge for trade unions closely aligned to political parties is how to avoid contamination from factional leadership battles.” He paid tribute to Fedunsa – the PSA’s umbrella union – for remaining politically independent. Both unions and public sectors have a critical role to play at this juncture, Jonas said, because South Africa is facing “urgent issues in our political economy”. The former deputy finance minister pointed out that South Africa’s economy has grown at an average of 1% since 1990. Compare this to emerging Asia, Jonas said, which has grown at 6%; or elsewhere in Africa, developing at 4%. “There is something fundamentally wrong with our economic growth model,” Jonas concluded. To fix it, he suggested that levels of economic participation need to increase radically, and the economy needs to be diversified with the aid of investors. “But for this to happen, we need legitimate leadership and a state that is credible,” Jonas said. Jonas condemned the behaviour of those political and economic forces “cunningly conjuring up a false enemy”, and welcomed the consequences that have befallen both British PR firm Bell Pottinger and the South African outpost of audit firm KPMG over the Gupta saga. “Whether we like it or not, the public sector is central to progress in South Africa,” Jonas told the audience. He suggested a number of practical steps that could be taken to increase the performance and accountability of public servants. They included an entrance exam for civil servants; removing staff recruitment power from ministers, and annual performance appraisals for civil servants. Jonas said that South Africa still has real strengths it can build off with the right leadership. It is a fitting illustration of the current leadership that Jonas has been reduced to the public speaking circuit while Muthambi bounces from one plum ministerial role to the next. In their addresses to the PSA on Monday, Jonas and Muthambi summed up the conflicting tides within South African government. Jonas delivered deeply considered thoughts on what public servants can do for the country, and how they can better be held to account. Muthambi congratulated public servants on their pay rise and reminded them of the benefits of government employment.